Scattered across the North American continent are many ghost towns, places that were once vibrant and alive but are now long dead and abandoned. Remnants of what once was can often still be found; old schools, churches or other buildings, usually in a ramshackle state of decay, stand, albeit perilously, serving as the only reminder that a community once thrived on the spot. The reasons a town can die are many and varied. In some cases, the town was bypassed by a railroad or highway. Other communities disappear simply because they have exhausted the natural resources which drew people to the area in the first place, mining towns come to mind. Wars, natural disasters, political wrangling and the like can all be reasons one community might be abandoned in favor of another. Perhaps, T. Lindsey Baker, author of Ghost Towns of Texas, said it best when he defined a ghost town as “a town for which the reason for being no longer exists.” Sometimes, though, you come across the story of a town that was abandoned for reasons other than those already mentioned. In a few cases, towns were deserted for reasons so unique and terrifying that they almost defy belief. 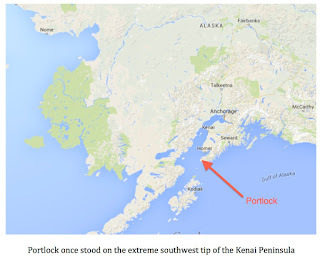 One such case is that of Portlock, Alaska. 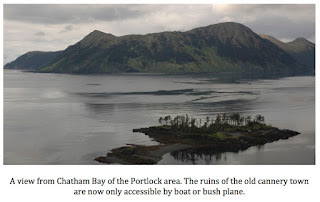 The remains of what was once Portlock/Port Chatham (technically, two communities but so close together I will simply use the singular Portlock for this article) sit on the far southwest edge of the Kenai Peninsula, not too far to the northeast of the more well known Kodiak Island. The settlement was named after Captain Nathaniel Portlock of the Royal Navy who landed on the peninsula in 1787. Some Alaska publications say travel to Portlock is possible via ATV but most locals would dispute it. The only real way to see Portlock is to travel there by boat or bush plane. If you were able to actually get to the abandoned town you would still be able to see the remains of what was once a healthy village. At one time there was a cannery, a chromite mine and a territorial boarding school for the children of the Kenai Peninsula. The town bustled enough that the government deemed a U.S. Post Office necessary and opened up a branch there in 1921. Everything changed, however, when every resident of Portlock picked up stakes and left en masse in 1949. Unlike most doomed communities, which die agonizingly slow deaths, Portlock ceased to exist almost overnight. What could have caused such a sudden and total mass exodus? A story from the Anchorage Daily News, April 15, 1973 may sum up the tale best. Portlock began its existence sometime after the turn of the century, as a cannery town. In 1921 a post office was established there, and for a time the residents, mostly natives of Russian-Aleut extraction, lived in peace with their picturesque mountain-and-sea setting. 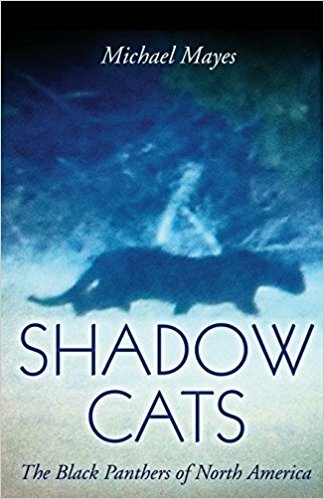 Then, sometime in the beginning years of World War II, rumors began to seep along the Kenai Peninsula that things were not right in Portlock. Men from the cannery town would go up into the hills to hunt the Dall sheep and bear, and never return. Worse yet, the stories ran, sometimes their mutilated bodies would be swept down in to the lagoon, torn and dismembered in a way that bears could not, or would not, do. Tales were told of villagers tracking moose over soft ground. They would find giant, man-like tracks over 18 inches in length closing upon those of the moose, the signs of a short struggle where the grass had been matted down, then only the deep tracks of the manlike animal departing toward the high, fog-shrouded mountains with their deep valleys and hidden glaciers. The newspaper story gives but a glimpse into the terror felt by the citizens of Portlock during this time. Finally, after numerous murders and unexplained disappearances, the town folk could stand no more. Enough was enough and they all agreed it was time to go, and that is exactly what they did, all at the same time. The villagers packed up and walked away from Portlock, never to return. Even decades later, former residents refused to return to the former cannery town for fear of the nantiinaq (Nan-te-nuk), or big hairy man. 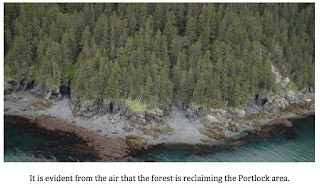 Former Portlock resident Malania Helen Kehl was interviewed by Naomi Klouda of the Homer Tribune back in October of 2009 and said things in Portlock started out well enough but degenerated to such a point that the family left their home and fled to Nanwalek. The family had endured the murder of Malania’s godfather, Andrew Kamluck in 1931. Kamluck was a logger who was killed when someone, or something, hit him over the head with a piece of heavy log moving equipment. It was generally agreed that Kamluck was killed instantly and that the murderer would have had to been a true brute to wield the piece of equipment in question as a lethal weapon. The family stuck it out in Portlock for more than a decade after the murder of Kamluck but after being terrorized for “a long period of time,” along with all the other villagers, they finally picked up and left. “We left our houses and the school and started all new here (Nanwalek),” said Kehl. Tales of murder and mayhem rolled out of Portlock on a regular basis in the 1930’s and 1940’s, gaining steam during the World War II years. Port Graham elder, Simeon Kvasnikoff told of the unexplained disappearance of a gold miner near the village during this time. Another interesting aspect of the Portlock story was relayed to Klouda by an Anchorage paramedic who preferred to remain anonymous. 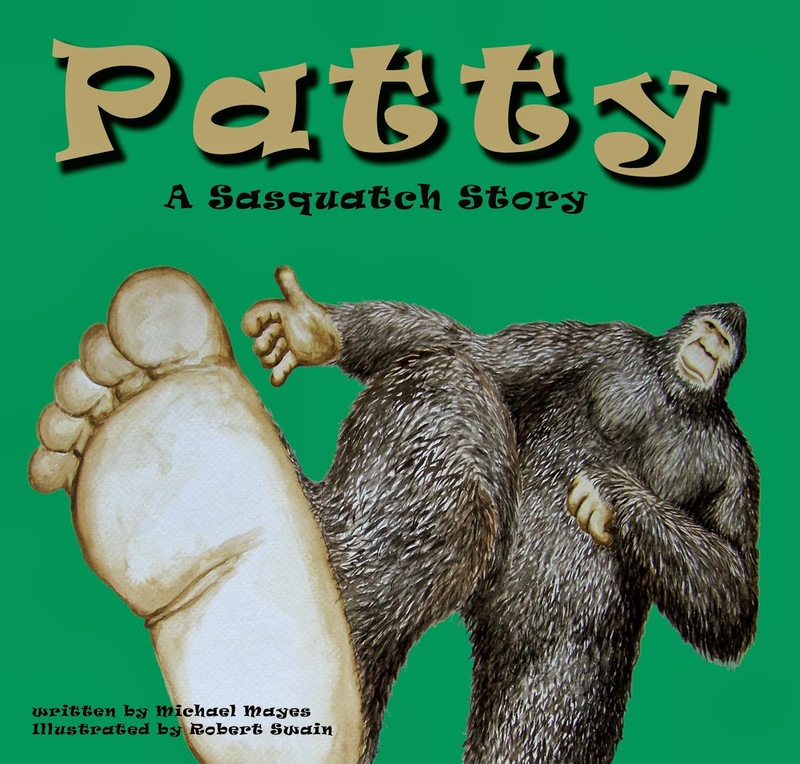 Many dismiss the tales that have come out of Portlock due to the aggressive nature of the sasquatch – for that is surely what the nantiinaq is, if it is real at all – allegedly involved. While it is true that most wood ape/sasquatch encounters end peacefully enough, that is not always the case. The Alaskan version of the species, if reports are to be believed, seems to be especially cantankerous, murderous even. In 1900, a group of hair-covered creatures ran at a prospector who had climbed a tree in an attempt to get his bearings near Thomas Bay. The prospector said they were, “the most hideous creatures. I couldn’t call them anything but devils…” The prospector, upon seeing the creatures advancing on him, was able to drop down out of the tree, get to his canoe and make his escape in the nick of time. He had no doubt in his mind that, had he not seen the creatures in time, they would have made short work of him. In 1920, one Albert Petka, who lived on his boat near Nulato, Alaska was attacked by a “bushman” (another regional name for a sasquatch-like creature). His dogs were able to eventually drive off the attacker but the damage was done and Petka’s injuries proved fatal. He was able to tell the story of his attack before dying. 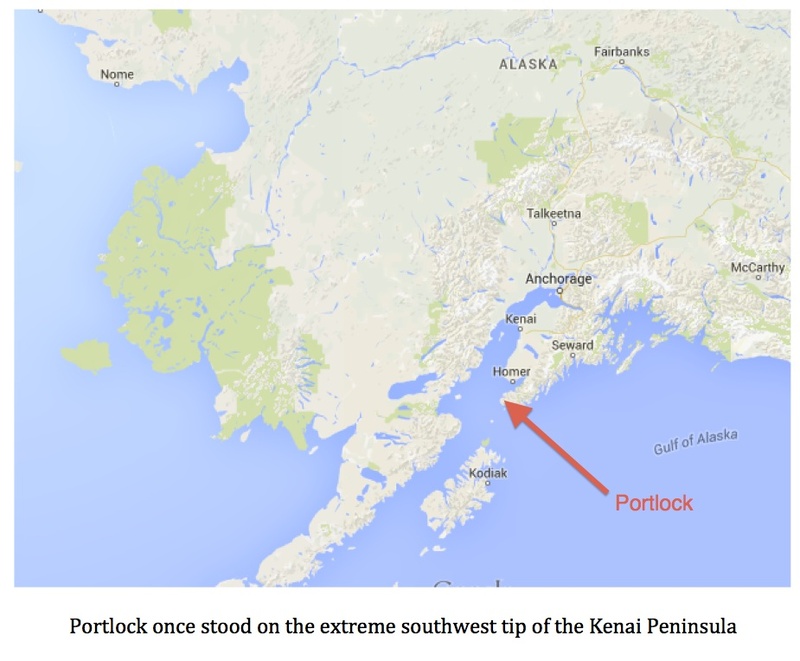 In 1943, during the height of the siege of Portlock, a violent attack took place at Dewilde’s camp near Ruby, Alaska. The victim, John Mire (some reports say McQuire), or “The Dutchman” as he was called by the local Native Americans, was killed by an assailant thought to be “the bushman.” He was badly beaten but his dogs eventually were able to run the killer off. Mire was able to get to his boat and travel to the nearest village to seek help but, unfortunately, he died of internal injuries shortly after arriving. He was, however, able to relate his story before passing. These are just a few of the reports of harrowing encounters with large, hair-covered bipeds that have come out of our northernmost state. There are more. The point here is that to dismiss the story of Portlock out of hand due to the murderous behavior of the alleged sasquatch involved would be a mistake. 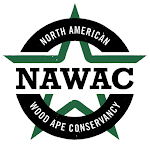 Tales of violent encounters/abductions attributed to wood apes have been told by native Alaskans for hundreds of years. There is precedence for this sort of behavior by these animals in Alaska. You may not believe that an entire town could be terrorized by a rampaging wood ape to the point that residents would abandon it. 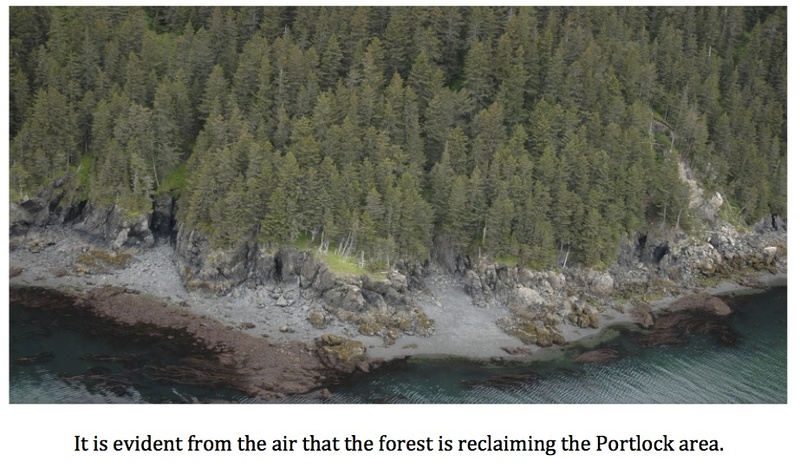 You may feel the strange story of Portlock, Alaska is, at best, greatly exaggerated and, at worst, completely fictional. What cannot be denied, however, is that Portlock was once a thriving community and that in 1949 residents left abruptly for no apparent reason. They left their houses, tanks, wharfs, pilings and their livelihoods and fled to nearby villages like English Bay and Port Graham. 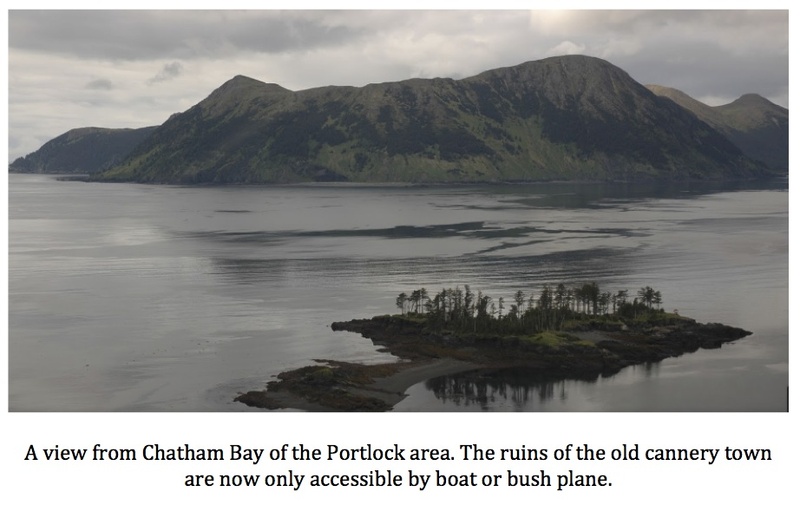 Also true is that residents of these two communities refuse to visit the ruins of Portlock to this very day. These two facts alone give the story the ring of truth. Something happened on the Kenai Peninsula back in the 1930’s and 1940’s, something bad. Green, J. (1978). Gentle Giants. In Sasquatch: The apes among us. Saanichton, B.C. : Hancock House. 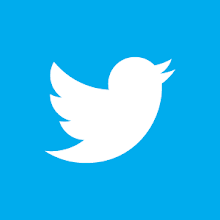 Bord, J., & Bord, C. (2006). Bigfoot casebook updated: Sightings and encounters from 1818 to 2004. Enumclaw, Wash.: Pine Winds Press.